I love its simplicity, its pure buttery taste, its crumbly texture. I love the way it brings me right back to my grandmother's kitchen at Christmas time. I'm so happy I found this recipe. Apparently it dates back to 1792. I got it from a holiday edition of Canadian Living Magazine, and I decided to try it because it must be good if it has survived that long. And it is indeed that good. It's classic. It's perfect. And what's Christmas without perfect shortbread? Cream butter & sugar together, then add the salt. Mix in the rice flour, cornstarch and all purpose flour. Finally knead in the last cup of pastry flour. Press the dough firmly into a 9"x13" baking dish, to about 3/4 inch thickness. Use a fork to prick the dough all over. Bake slowly in a 300 degree oven for about an hour (or more, until lightly golden). Slice into desired sized rectangles or squares while in the pan, and allow the shortbread to cool completely in the pan before removing. 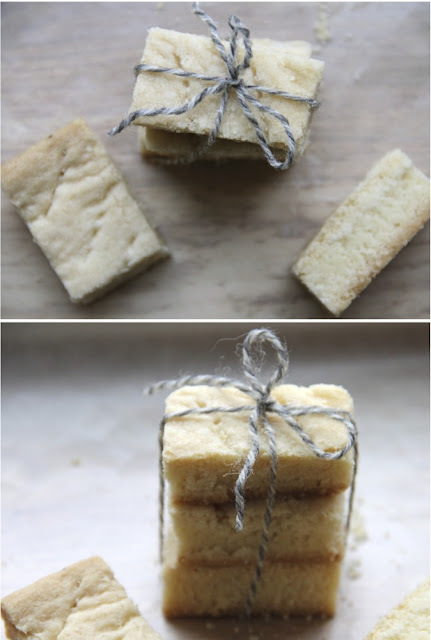 Pack in tins lined with wax paper and store in a cool dry place.... the shortbread will keep for weeks, and in fact may even get a bit better as it ages to perfection! What?! I am definitely book marking this! I love it because knowing that the Scots came over to Canada with their short bread cookie recipe means it's legit! I love traditional short bread. One pound of butter- it must be good. I know you can't skimp on these things but recipes like this are better for me to eat- not make.